This should be worn high above the neck, behind the ears. Choke collars, while still popular, are now rarely used for dog training due to the lack of mechanism that stops the collar from constricting. This type is quite controversial as it is unsafe to leave the collar on if the dog is not supervised. 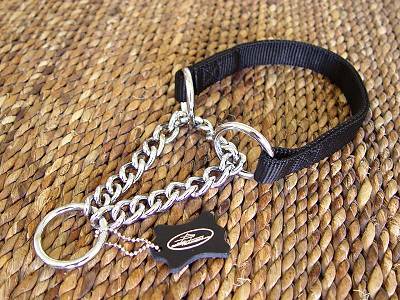 Also popular for its name pinch collar, is characterized by chains with open ends that are turned towards the dog's neck. Thus, when the collar is tightened the dog feels the spikes on the loose skin of his neck. Unlike choke training collars, prong collars have limited adjustment which also limits the amount of pinching the spikes could give the dog. Because of the spreading effect of the blunted spikes it is difficult to puncture the skin of the dog. Popular with its names shock collars and remote collars, this kind delivers electrical impulses or a spray of citrus smell whenever the dog misbehaves. For proponents this collar helps break unwanted behaviors easily especially if the owner does not have sufficient time for training. Also it makes handling the dog a lot easier. These could limit their natural inclinations to run (and not really escape), to wander, to bark at strangers and to attack people or dogs in protection of themselves or their masters.